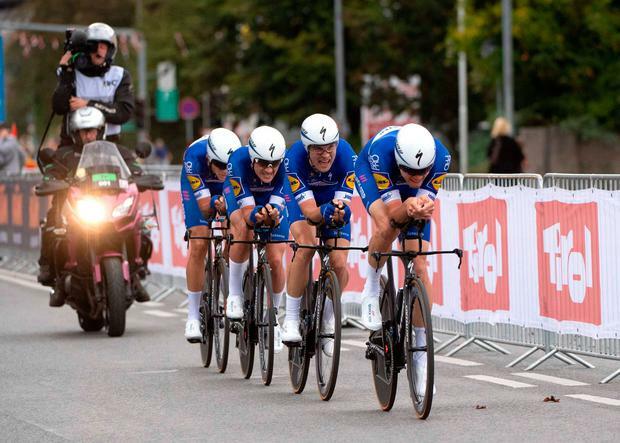 Quick-Step Floors were convincing winners of the team time trial World Championship in Innsbruck yesterday, on the first day of the event. The Belgian squad, which featured Kasper Asgreen, Laurens De Plus, Bob Jungels, Yves Lampaert, Max Schachmann and Niki Terpstra, scorched the 62.8km route, to defeat Sunweb and BMC into second and third, 18 and 20 seconds behind respectively. Team captain Lampaert said: "We're so happy. The feeling is incredible. We're a very strong team but with a lot of young riders. We didn't panic after we got the first time check. "We knew the climb was yet to come. All year long, we have won a lot of races but to take the world title as a team is something special." Meanwhile, Lara Gillespie is the first Irish competitor in action with the Junior Women's time trial set to get under way this morning. The Wicklow native, who rides for Scott-Orwell Wheelers, will be hoping to have the same sort of form that saw her win silver and gold on the track at the European junior championships last month. In the afternoon, Michael O'Loughlin and Conn McDunphy take part in the U-23 time trial. Fabio Aru has withdrawn from the Italian team for Sunday's Men's Elite Road Race - "my condition is not where I'd like it to be,'" he admitted. Independent.ie Sportsdesk Sam Bennett finished third in the final stage of the Tour of Turkey after the Bora-Hansgrohe sprinter gambled with a solo attack in the final kilometre in Instanbul. Ciarán Lennon 'Five years ago I looked down on sport, I didn't see the point. Now I'm riding around in a circle with four people. I'm like, 'This is the best thing ever'. I didn't appreciate it, I didn't understand it, but now I'm all in."